Adorable and Fun. Two words that describe the vintage that is The Stellar Boutique. 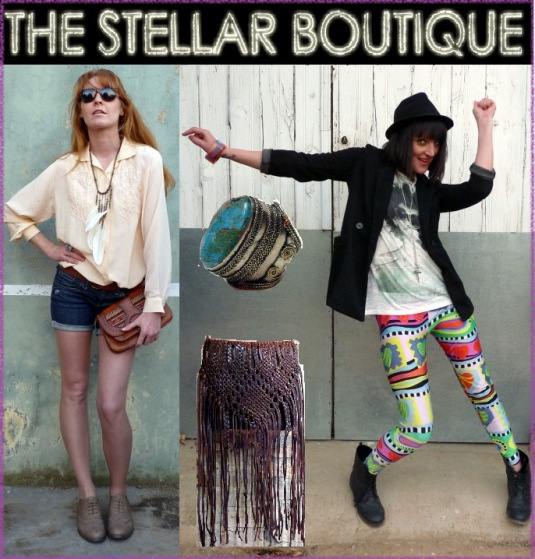 “The Stellar Boutique was created out of a love for all things original and authentic.” It provides its customers with not only unique vintage clothing and accessories, but also with both vintage and new home goods. And while I find the home goods charming, I definitely tend to stray towards the vintage clothing and accessories which she has so expertly separated into decades for me! Her strength: Vintage bags. If you are in the market for a great vintage bag, then you should definitely check Stellar out. Especially if you love leather, fringe and studs! Which I definitely do! Another thing I love about Stellar: The Rings. Huge, beautiful chunks of stone in silver just begging to be bought! It’s seriously hard to resist! Check out more about Stellar here. This entry was posted in Press and tagged boho clothing, fashion, fashion accessories, fashion boutique, fashion online, fashion shop, fashion trends, online vintage boutique, rings, vintage, vintage accessories, vintage clothes, vintage clothing, vintage clothing online, vintage clothing womens, vintage jewellery, vintage jewelry, womens vintage clothing.